The Vodnik has a water displacing hull, so it really can only ford water barriers and is powered in the water by its wheels... not really good enough for a recon vehicle. MOSCOW, October 26. (ARMS-TASS). 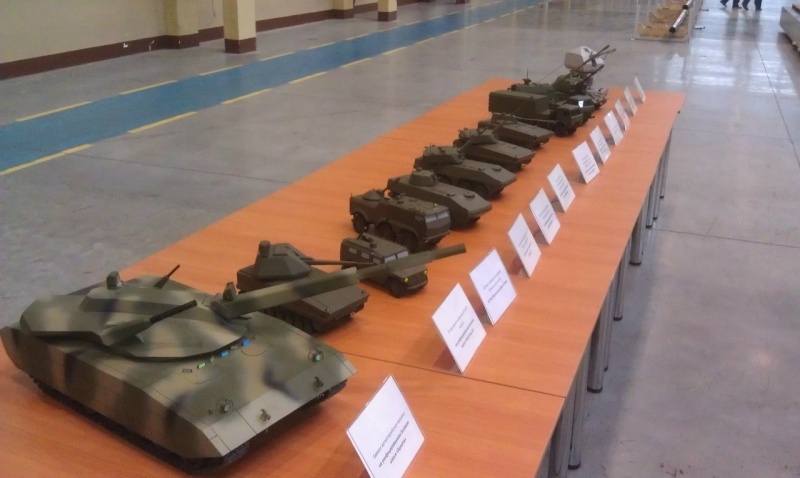 In Russia, for the rearmament of the army is developing a unified platform for military wheeled armored vehicles, medium and heavy tanks, the new generation, said korr.ARMS-TASS General Director of "Military-Industrial Company" / MIC / Dmitry Galkin at "Interpolitech 2011." Work on the new platform performs a part of the MIC Arzamas Engineering Plant. "Right now, the company's activities focus on development and design work to establish a combat wheeled platforms, ordered the Ministry of Defence - said Galkin. - This is a fighting machine the next generation." According to him, the new machine "is not similar to any modern APC." "This is not an APC. We call it" combat wheeled vehicle, "because at its base will be created as APCs and IFVs, and a tank or a heavy gun," - said the head of the MIC. He explained that under the "modernization and upgrading the Russian Armed Forces, the Defense Ministry has ordered while three types of development projects: on wheeled vehicles - the company MIC, the average caterpillar -" Kurgan "and the heavy caterpillar -" Uralvagonzavod. "At the same time the Ministry of tasked to ensure maximum unification of all three cars. "All of these machines can be unambiguously standardized by CICS (onboard information control system), aiming systems, communication systems, combat modules", - informed the head of the MIC. Two prototypes were wheeled vehicles to be built by 2013, he said. Galkin said that under the "permitted capacity", plan to use advanced foreign experience in this field. "We are now open in this respect, and where we allow the defense and national security, we use those developments that exist in the world" - he said. The head of the company said that implemented development projects included in the state armaments program through 2020, created a new generation of armored vehicles will be supplied to the army under the program. "In Russia, for the rearmament of the army is developing a unified platform for military wheeled armored vehicles, medium and heavy tanks, the new generation, said korr.ARMS-TASS General Director of "Military-Industrial Company" / MIC / Dmitry Galkin at "Interpolitech 2011." So that means to me that there will be a military wheeled armoured vehicle for light and medium, and 'tanks' for medium and heavy... in this case tanks simply referring to tracked vehicles. "According to him, the new machine "is not similar to any modern APC." "This is not an APC. We call it" combat wheeled vehicle, "because at its base will be created as APCs and IFVs, and a tank or a heavy gun," - said the head of the MIC." So the Kangaroo/Boomerang will not just be a 25 ton amphibious APC, it will be an APC AND IFV AND a tank of gun armed fire support vehicle... this suggests a troop carrier version (BTR) and a more heavily armed IFV version (BMP/BTR-90) like vehicle. This sounds a little strange as the Kurganets-25 is a 25 ton amphibious vehicle for the same units, but I think they will likely have tracked and wheeled versions of all vehicle types where possible in the medium brigades as in the middle of Siberia the ground conditions will mean the whole medium brigade will be tracked (kurganets-25 based), while in western Russia the better roads means wheeled vehicles can dominate as they are cheaper to buy and operate and are much faster when operating on roads. "He explained that under the "modernization and upgrading the Russian Armed Forces, the Defense Ministry has ordered while three types of development projects: on wheeled vehicles - the company MIC, the average caterpillar -" Kurgan "and the heavy caterpillar -" Uralvagonzavod. "At the same time the Ministry of tasked to ensure maximum unification of all three cars." So MIC will make the medium wheeled vehicles (Boomerang/Kangaroo, and also the light the Typhoon), the medium Kurganets-25 and Heavy Armata will be developed and made at UVZ. Perhaps that is your answer... the Typhoons will likely be amphibious and the 4 wheel model will be the BRDM equivalent, while the 6 wheel will be the troop transport (APC/IFV), direct fire support (Tank), ATGM carrier, air defence vehicle (with 8 ready to fire MANPADS and HMGs as used in the Phoenix turret on the Vodnik? ), etc etc. "All of these machines can be unambiguously standardized by CICS (onboard information control system), aiming systems, communication systems, combat modules", - informed the head of the MIC. So the Armata "tank" and the Kurganets-25 and Boomerang/Kangaroo "medium tank"/gun platform and the Typhoon gun platform will have standardised "avionics". Keep in mind that the medium (kurganets-25 and Boomerang/Kangaroo) vehicles, at 25 tons for the standard vehicle the tank version could be 35-40 tons... remember the Armata chassis is something like 40-65 tons payload vehicles for the different versions with different roles. Also be aware that the 2S23 Sprut light tank/gun support vehicle was an 18 ton vehicle with a full power 125mm gun with slightly longer recoil distance to reduce recoil. Two prototypes were wheeled vehicles to be built by 2013, he said. So if you see a photo of a real Boomerang/Kangaroo before then it is BS or a mockup. As much as I like them, there is one problem with the Tigr, Volk, Vodnik et al. : They are not amphibious like the good old BRDM-2. Actually Vodnik is amphibious, that is why I thought it could be BRDM replacement. Also Vodnik is modular design, so it could have for different tasks different equipment. I thought the Vodnik was amphibious too, but looking up its specs it says it has a "water displacing hull", and has a fording limit of 1.4 metres. Considering it has a modular design, I would think an amphibious hull version equipped for the armoured recon mission would make a lot of sense, but despite mention of its modular design I have never seen a chart showing the options and set ups possible. 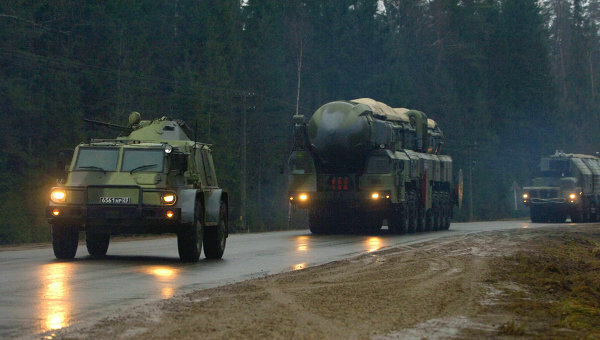 Here is a Vodnik leading a formation of TOPOL-M ICBM launch vehicles to a test launch. Obviously there would be little need for an amphibious vehicle for such a role as there is no way a TOPOL-M launch vehicle would be able to follow an amphibious vehicle through water obstacles. 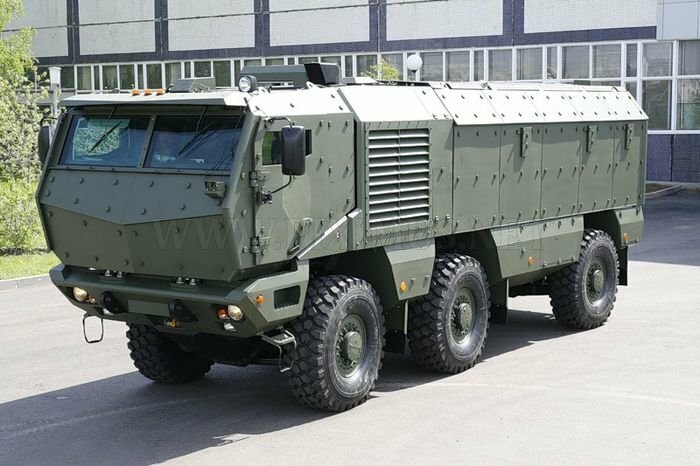 It is important to note that despite the Kamaz Tafun armoured truck... which looks pretty cool BTW, the Typhoon we are talking about will be designed and built by MIC Arzamas Engineering Plant. We know from a poster Cyberspec posted of engines that the Typhoon will have a range of engines from 350-450hp and that the vehicle itself will come in two base models with 4 and 6 wheels respectively. A BTR-60 with an 85mm gun. In June, completed phase of the prototype of a new family of armored multi-purpose army, known under the code "Typhoon". The main difference between the new family of analogues, both domestic and foreign design - a stuffy high level of protection. It surpasses even those requirements that are placed in front of foreign military today with his heavy armored army vehicles for general purposes. Armored protection of the family "Typhoon", which was worked out by experts and research institutes created Steel, incorporated many solutions that are used for the first time. Integrated ceramic armor to protect the basic projection machines, new solutions for mine protection, including minozaschischennye chairs for the crew and troops, glazing protection from large-caliber firearms, the new brand of armor steels are still the best armored steel in the world - just some new items Protection, which were first used here. "It is encouraging that domestic enterprises are beginning to produce armor materials, including ceramics, in no way inferior to the best world analogues. These materials, we can safely use in the construction and protection structures, and they allow us to meet even these stringent requirements for the protection that had been raised in relation to the military machines of the family "Typhoon" - said the President of JSC "Research Institute of Steel", Director of Science, Academy of Rara, Ph.D., professor Valery Grigoryan Armenakovich. 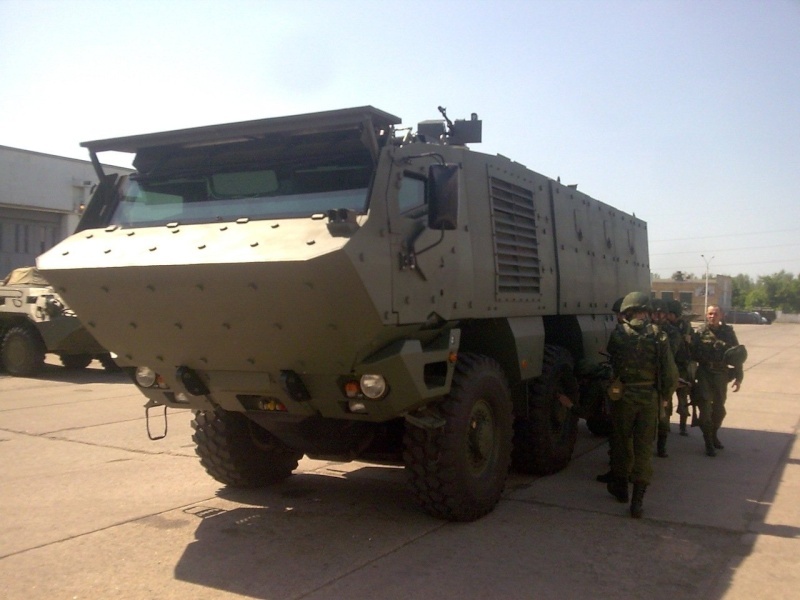 Unlike previous attempts at the Russian Defense Ministry to create a highly protected armored vehicle with high performance based on the chassis serial commercial vehicles, and did not continue, a new development - a family of military armored multi-purpose "Typhoon", based on a special chassis designed for those loads experienced in armored combat missions. Hopefully they pay attention to smart rounds for Future IFV/BMPT variants. That is nice, but laser guided shells for direct hits will be more effective in my opinion... those small tungsten balls would not penetrate the outer armour of the Hokum let alone the inner layer... and most of those engagements were at 2-2.5km which puts that 40mm bofors gun well within range of the 30mm cannon on the Hokum... not to mention the 15km range of Hermes. Note most of the targets were stationary or heading right towards the gun... the reason the current standard AAGs are 30mm with burst fire at very high rates of fire is to achieve a scatter burst effect like a shotgun blast to allow for the target manouvers... This 40mm round is trying to compensate with proximity fused ammo. I would suggest the larger payload of a 57mm gun plus laser guided shells would make it rather better. GarryB wrote: That is nice, but laser guided shells for direct hits will be more effective in my opinion... those small tungsten balls would not penetrate the outer armour of the Hokum let alone the inner layer... and most of those engagements were at 2-2.5km which puts that 40mm bofors gun well within range of the 30mm cannon on the Hokum... not to mention the 15km range of Hermes. Not to mention that the Hokum will do well to stay out of range in the first place, and simply blast such targets with its missiles. But on the whole, a nice little gun. Very simply they went for the 40mm Bofors gun because the armour of the BMP-3 requires a heavy calibre to ensure penetration from reasonable battlefield distances. The new Armata based heavy brigade vehicles will require tank level main guns to engage all the vehicles in the brigade... which will make it a very powerful force, though it would be a breakthrough force, or something you sent into a hostile urban area. 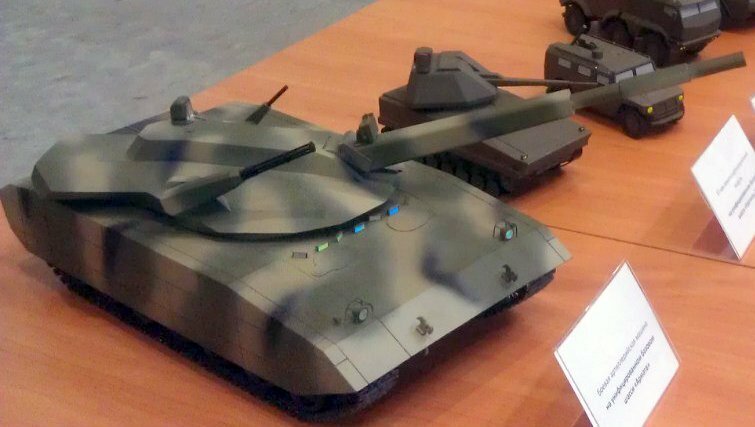 Even the Kurganets-25 will be a tough nut to crack at about 7 tons heavier than a BMP-3, as will the Boomerang-25. The Russian Defense Ministry has decided to equip the Ground Forces mostly with wheeled rather than tracked armored vehicles, GF Commander Col. Gen. Vladimir Chirkin said on Monday. “The Defense Ministry has decided to replace the majority of tracked armored vehicles with wheeled vehicles,” Chirkin said. The general said the replacement will involve self-propelled guns, air defense systems, and light tanks.One of the main reasons for the replacement is the longer service life of the wheeled vehicles, he said. “The service life of the tracked vehicles until a major overhaul is up to 30,000 kilometers while that of the wheeled vehicles is up to 1 million kilometers,” Chirkin said. Wheeled vehicles will also allow the military to minimize railroad transport during redeployment. Russia signed a deal with Italy’s Iveco Company last December on the semi-knocked down assembly of Lynx light multirole armored vehicles for the Russian Ground Forces in the central Russia city of Voronezh. 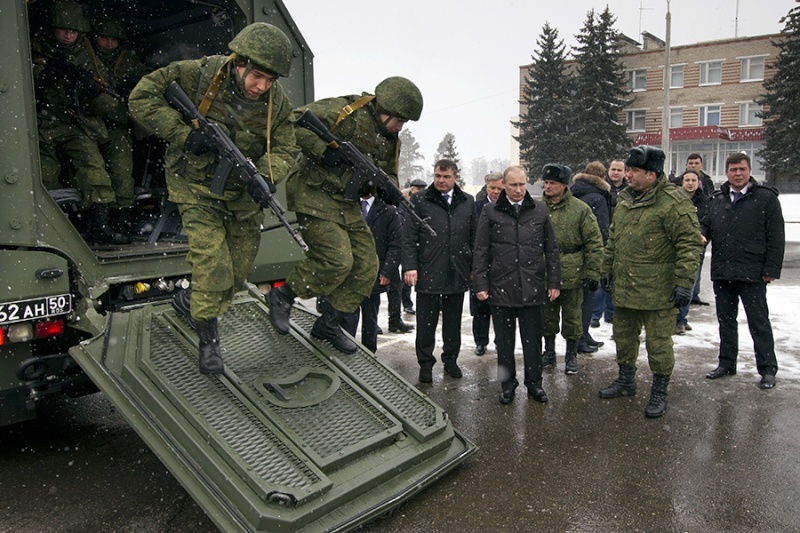 In addition, Russia is currently working with France on the development of armored vehicles with a French wheeled base but equipped with Russian weapons and Russian turrets. 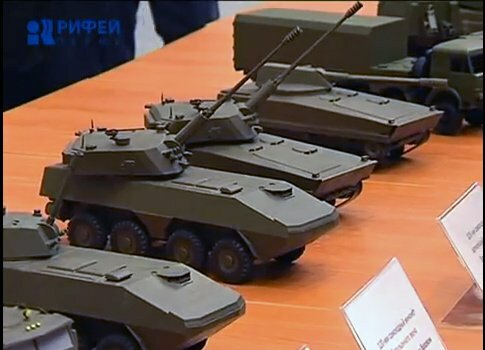 The future structure of the Russian Army will be in Brigades, and as the Heavy brigades will be fairly expensive to buy, and will be used in difficult situations like urban areas then each of the four military districts will likely have a small number of heavy brigades (tank and motor rifle), while most of their brigades will likely be wheeled (boomerang-25) or tracked (kurganets-25). Finally the light brigades will be the most mobile and fastest reacting. Each weight class and formation type (tank or MR) will suit different tasks... in swampy regions the medium tracked vehicle brigades will be most effective, while in urban areas with excellent roads then light and medium wheeled formations will be better off, but combat against a well equipped enemy in an urban area will require heavy tracked vehicles. The wheeled units will be cheaper to buy and easier to support in the field, but we need to keep in mind a few things... first the Boomerang-25 is not just a BTR... at 25 tons these vehicles will be 5 tons heavier than the BTR-90/LAV-111, and 11 tons heavier than a BTR-80A. Secondly the electronics and sensors and weapons will be rather better with much better communication and support units and smart weapons and ammo, and with the much better C4IR they will be better able to find and kill enemy targets in all weathers day and night. 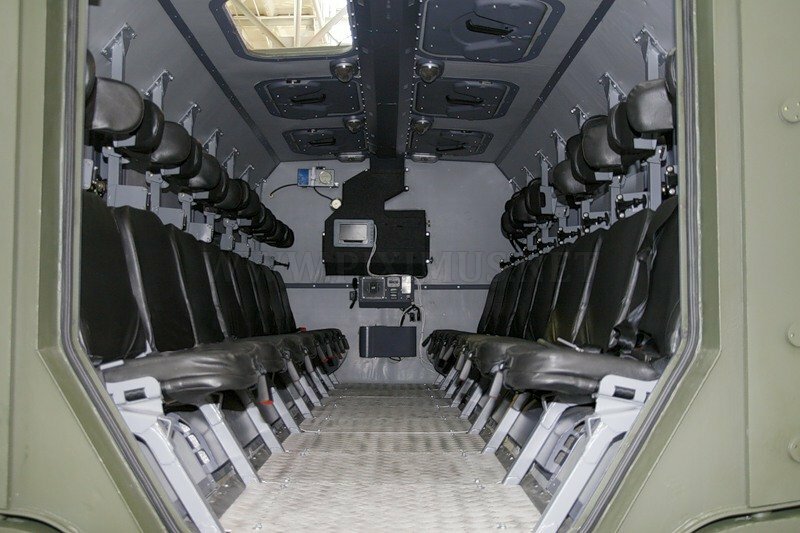 And indeed the air support will be of much better quality too... no more waiting for morning for Hind support... with President-S systems fitted the Mi-26M could come in and fly out any damaged light brigade vehicle if needed. Right now a modern Russian brigade is a mish mash of different vehicle types, including ACRV command vehicles, and BTRs and BMPs and T series tanks and SA-8 6 wheeled vehicles and towed artillery had MTLBs etc etc. Different engines, different tracks, different parts and sensors and weapons. The new brigades will standardise the vehicle chassis and engines and electronics and sensors and weapons where possible. It is pretty clear from the post above that they realise the cost savings of using wheeled vehicles so their might be rather more Boomerangs than Kurganets. There were plenty of BTRs, but the BMP was popular too because of its better firepower and armour. With the Boomerang-25 in the same weight class as the Kurganets the wheeled vehicle might become rather more popular with similar armour and firepower options, but still lower operating costs and better mobility on flat hard surfaces and still reasonable mobility over rough ground. here is some pictures that show maybe the Armeta units. 1st pic. is IMO the Armeta tank with 125mm gun, 23mm Gatling gun on his right and 57mm grande launcher on his left. or it's the BMPT? 2nd pic. is the 25 ton Kung. with 120mm mortar. 3rd pic. is the 4*4 Tiger. 4th pic. is the Kamaz Typoon. 5th pic. is the Boomrang with 120mm mortar. 6th pic. is the Boomrang with 152 mm gun. 7th pic. is the 25 ton Kung. with 152 gun. 8th pic. is the 25 ton with anti tank gun. I'm just guessing i hope some of you can do it better. I have read it has a rifled 120mm gun/mortar so I would say it is a BMPT vehicle rather than the tank model. Also the tank vehicle the weapon on the far side of the turret would likely be a long barrel 30-40mm grenade launcher. Kurganets, and I agree it is probably the 120mm rifled gun/mortar again. Agree on the vehicle but the gun is either the new 45mm gun or the new 57mm gun, which makes these two models the IFV versions. It is tracked and it is not armata so it must be Kurganets, and I suspect this is the MBT model of kurganets. BTW the Kamaz Typhoon is basically an armoured modular truck to replace the BTR-80 for MVD and FSB forces. It is not related to the previously mentioned Typhoon that was going to be the vehicle for the light brigades in the 10-15 ton class. That has been replaced by the simpler method of shortening the Boomerang-25 to make a Boomerang-10 that is shorter and lighter but otherwise uses related components and systems for commonality. The low cost of wheeled vehicles will mean that they will be the main vehicle I suspect... they are cheaper to buy, easier and cheaper to maintain and cheaper and easier to operate. 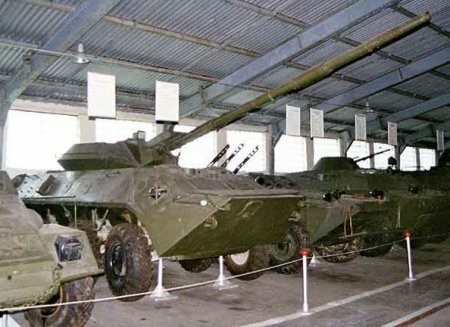 Previously the problem has been they tended to lack protection and firepower compared to their tracked equivalents... ie BTR vs BMP, but in this case the Kurganets and Boomerang are both 25 ton class vehicles with the same sensors and weapons and electronics so unless there is deep mud or deep snow it makes sense to have more wheeled vehicles. If you look at this image above you can see the 23 x 114mm third from the end... that is the 23mm round the 6 barrel gatling on the armata BMPT above fires. 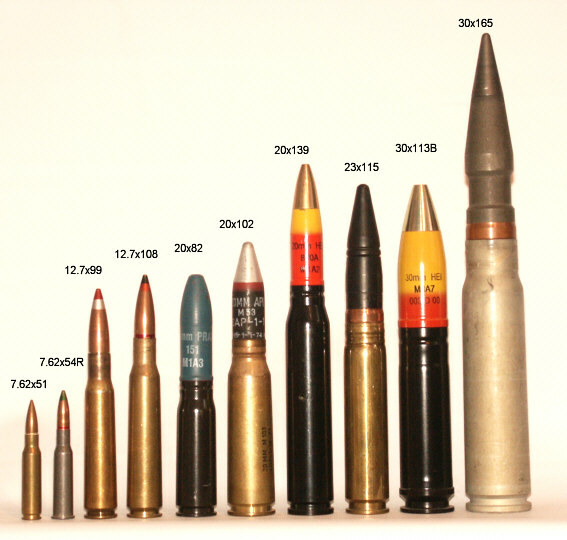 The round next to it on the right is the 30mm low velocity cannon shell used by the Apache helo and the biggest round there is the standard Russian 30mm cannon shell, used in their Army (BMP-2/-3, Tunguska, etc), Navy (Kashtan, AK-630, etc) and Air Force (Mig-29, Su-27, Mig-27, Su-25). As you can see the Russian 30mm round is enormous and powerful. The Russian 23mm round is based on the 14.5 x 114mm HMG and anti tank rifle round necked out to take the 23mm cannon projectile of the ZU-23 and Shilka (ZSU-23-4) 23 x 152mm round. This creates a low velocity low recoil round with a heavy projectile... like the 30mm shell of the Apache... which is very effective against ground targets because of shell weight. High velocity is more important against aerial targets and is wasted energy against most ground targets. So the truck (Typhoon) in the pics will serve the internal troops and the Army will get the boomerang-10? Sorry it's a little confusing, I've heard some contradictory things regarding typhoon before. Zivo wrote: So the truck (Typhoon) in the pics will serve the internal troops and the Army will get the boomerang-10? 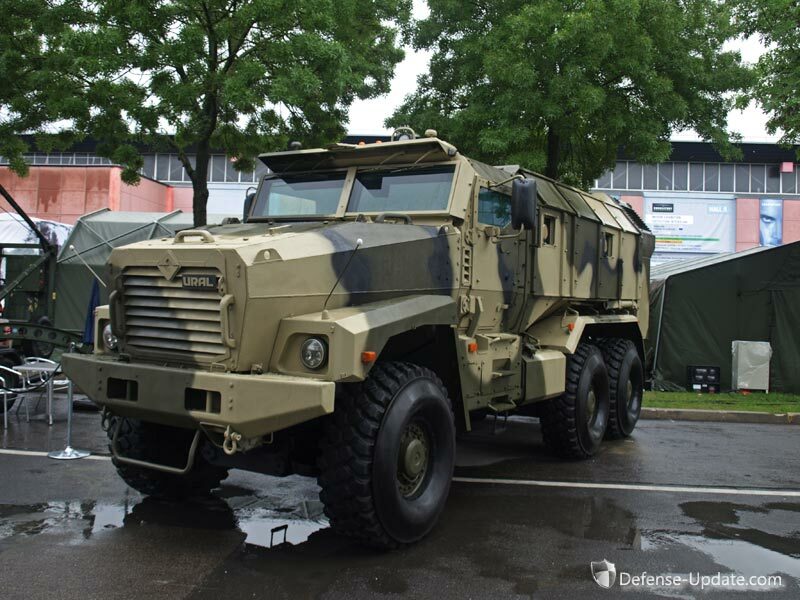 Army will have Typhoons, but it is a special purpose truck, not a standard cargo truck/APC. 90mm Cannons still a need or Medium Caliber Cannons outperform them? 90mm cannons have been a weapon of choice on many different armored vehicles both tracked and wheeled like Scorpion 90, CadGage V150, Sibmas, etc. And in different turret systems like CMI's CSE90. However, in recent IFV systems we see the medium caliber automatic cannons employed mainly in calibers 30, 35 and 40mm (Both Bofors and CTA). In terms of lethality and fire support, do you still see a need for 90mm cannons or are they relics of the past? In the US the 90mm is probably not useful because we require multiple weapons systems to defeat other modern tanks on a peer-to-peer battlefield in offensive operations. Even the modern 90mm is unlikely to be consistently effective against a first-tier tank. It comes down to the good enough rule. In the 1920s and early 1930s you didn't need a huge gun to penetrate the armour of enemy vehicles, so a 37mm, 40mm or even 45mm gun was standard for the anti armour role. For anti personnel they either had machine guns or very short barrel 76.2mm guns with a tiny shell case and a low velocity round designed for HE capacity rather than armour penetration. By the start of WWII the 37mm, 40mm, and 45mm were just not cutting it... especially at longer ranges so the move to larger calibres was lead largely by the Soviets with their dual purpose 76.2mm guns that had both velocity and shell weight to penetrate armour and carry a useful HE charge. Today it is a case of what you need to penetrate the enemy equivalent vehicle reliably from 2000m. If you look at the BMP-3M the 30mm is great for a range of targets but against 32 ton western IFVs it is inadequate so a step up in calibre is needed and a 45 or 57mm gun with modern APFSDS rounds will probably be ideal. For the west however if the Armata is the enemy IFV then they will need a 120mm gun with no 90mm gun cutting it. If NATO adopts the same armour structure as Russia (the way they embraced the IFV for instance) then the Russian IFV will also need a 125mm main gun so effectively the role of the tank will actually expand rather than diminish. The 90mm M3 was a neat and tidy affair that fit into a turret wit the same 69" ring diameter as the M4 Medium, although the turret was taller with a pronounced counterweight at the rear. Identical in ballistic performance and firing the same ammunition as the 90mm M1 AA gun, this weapon was developed specifically for use in armored vehicle turrets. Performance was comparabile to the German 8.8cm L56 KwK 36 of the Tiger I. The M3 had difficulty against high obliquity targets such as the hull front of the Panzerkampfwagen V Panther firing standard M82 APC (actually an APCBC/HE-T type round)and T30E16 HVAP-T (APCR-T). For this reason the T33 AP-T (really an APBC-T) round was developed which in spite of a lower muzzle velocity could achieve frontal kills on the Panther hull at 1,100 yards instead of the 450 yards for the T30. Both ammunition types were issued to the 20 T26 Pershing tanks that saw combat in WWII. The 90mm L73 T15E1 gun was an attempt to provide the same kind of performance as the German 8.8cm PAK 43 anti-tank gun. Like the German gun in addition to the longer barrel the gun fired ammunition with a larger propelling charge. Muzzle velocity firing the T30E16 projectile increased from 3,350fps to 3,750 and T33 from 2,800fps to 3,200fps, increasing the range at which a Panther hull front could be penetrated to 2,600 yards! Originally the T15 used one-piece ammunition but at 50-inches long it was too bulky to handle in a tank turret so a redesign was undertaken to employ 2-piece seperately loaded rounds, which became the T15E2 to be mounted on the Heavy Tank T26E4. Even with 2-piece ammunition the cartridge case extended past the turret ring during loading which could cause problems at anything other than level elevation. Considerable modification was required to fit the gun to the T26 turret including welding a large counterweight on the turret rear, installing a reinforced elevating mechanism, travelling and release locks, and external equilibrator springs. These latter were eventually replaced by internal hydropnuematic types. Ammunition capacity dropped from 70 to 54 rounds. There was an HE round in addition to the AP types. Improvements to standard tank gun ammo combined with the loading difficulties of the long 2-piece rounds resulted in interest in the T15 evaporating after the end of the war. We had IFV´s with 90mm guns, they were scrapped in the 90´s. To slow to engage enemy IFV and to small to engage Tanks. The Bofors 40mm is good enough against todays IFV´s and air targets, and i know they are working on a supersonic APFSDS ammo that would be able to cut Tanks, but if it will work is as yet unknown, the research has been ongoing for some 10-15 years.